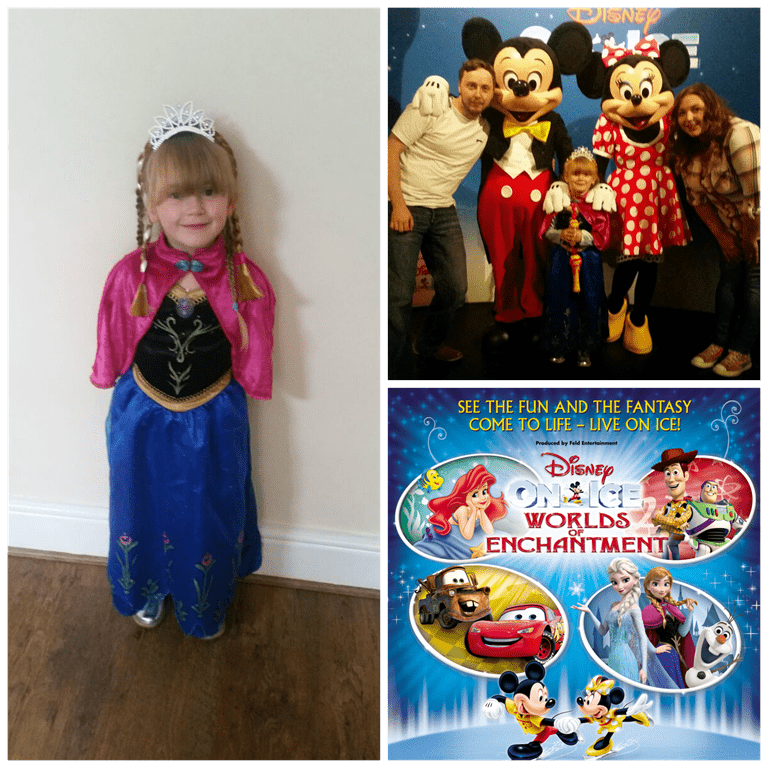 Little Legs was invited to the opening night of the new Disney on Ice show, the Worlds of Enchantment in Manchester (with myself and the Mr of course). Little Leg’s is a huge Disney fan (and I’m not ashamed to admit that I am too) so she was ecstatic to see some of her favourite characters. Before the show we were invited along to a VIP meet and greet, to meet none other than the legends that are, Mickey and Minnie Mouse. Little Legs was rather impressed and declared that it was the best night ever. The show opens with an entertaining section inspired by Toy Story 3. It was amazing, so cleverly done and we were mesmerised from the offset. The journey started in Andy’s bedroom as he says goodbyes to his beloved toys before he sets off to college. For the next 35 minutes the show follows the story of the gang and their time at Sunnyside Day Care. 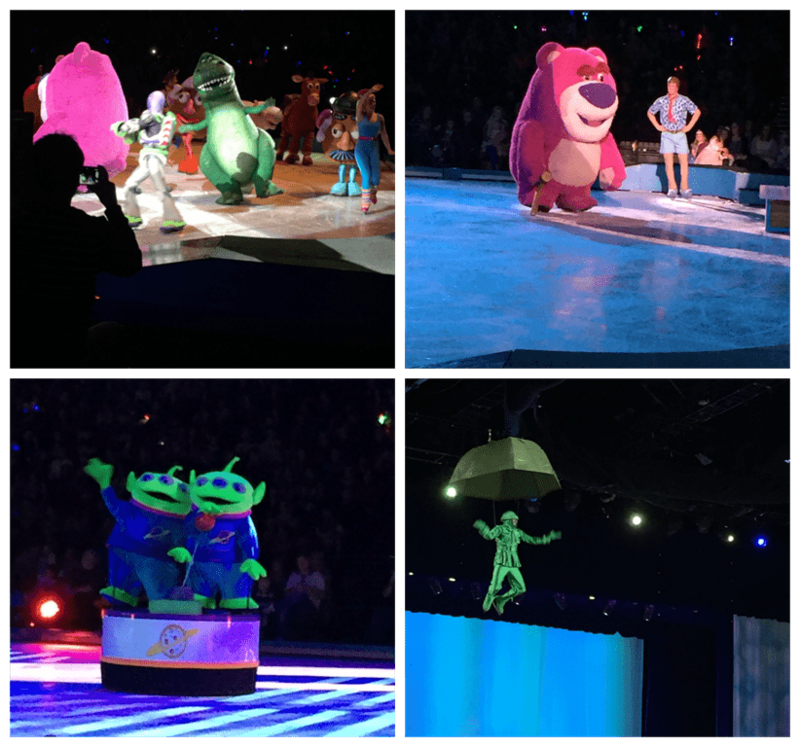 Having never seen a Disney on Ice show, we were completely impressed as the characters played their parts perfectly and the skating was flawless. Next up was a short version of The Little Mermaid where we sang along to some of our favourite songs. Little Leg’s was suitably impressed with Ariel, she is one of her favourite characters. After a toilet and refreshment break we sat back down to the second half to enjoy a Disney Car’s inspired section of the Worlds of Enchantment tour. It was done brilliantly, Little Legs and the Mr were captivated. 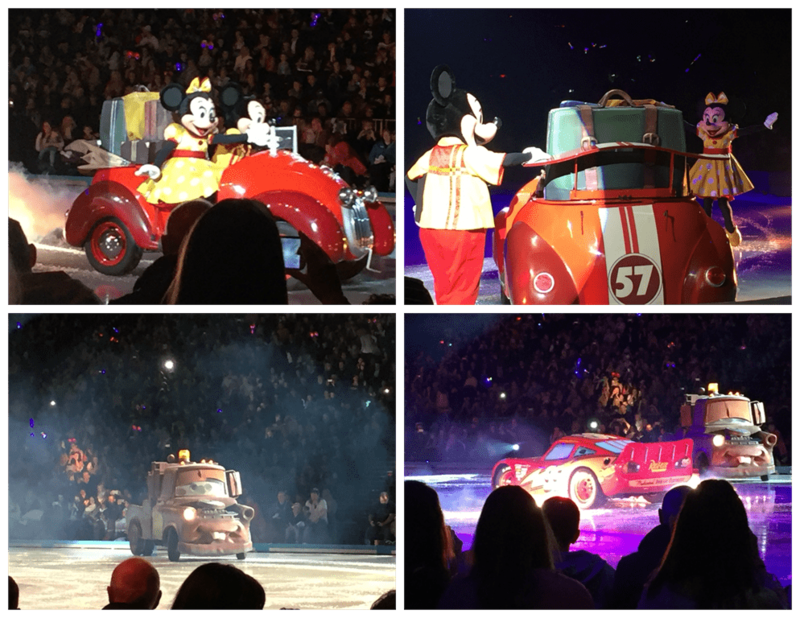 Lightening McQueen, Mater and friends, sprang to life and whizzed around on the Ice and coming to the rescue of Mickey and Minnie. We couldn’t figure out how the cars were controlled, our theory was that they were remote controlled from behind the scenes but we could have been wrong, either way it was very cleverly done. The final part of the show saw the ice rink being transformed into Arendelle, and as most of the little girls watching the show were dressed as Anna or Elsa, it was what everyone had been waiting for. Frozen! The film that has captivated households (especially little ones) so it was definitely the highlight of the night. 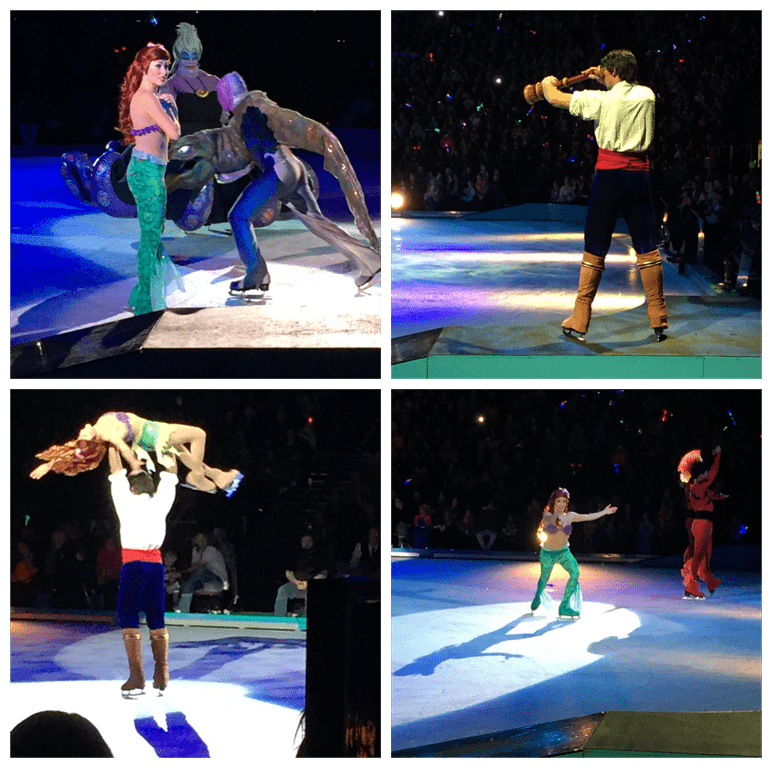 The Frozen part of the show was very well put together with perfectly magical results. I don’t think there was one person that didn’t sing along, especially when it came to “Let it Go”. The whole set was amazing with the ice castle, the lighting and the fireworks. Little Leg’s absolutely adored Olaf’s part as he sang “In Summer”. She was completely mesmerised throughout the show and you could see the awe in her eyes. 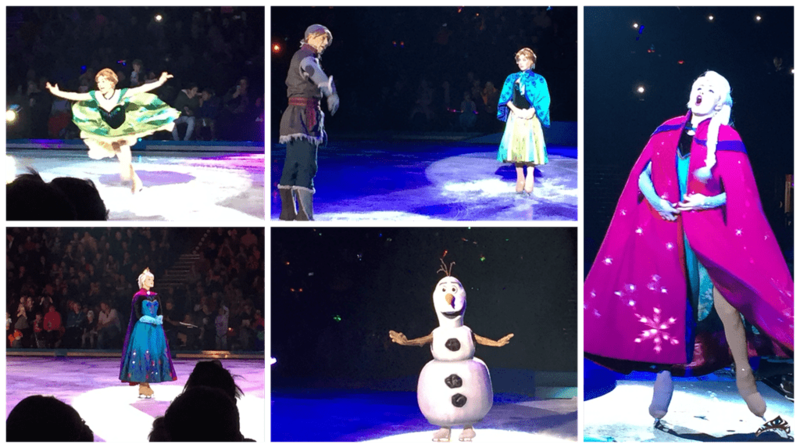 I didn’t know what to expect from the show but can honestly say, it was amazing, I’d recommend everyone to go and see a Disney on Ice show at least once. The shows are truly magical for all the family, we can’t wait for the next one. The Worlds of Enchantment tour is showing across the UK until the beginning of January in Glasgow, Newcastle, Manchester, Glasgow, Birmingham, Newcastle, Belfast, Dublin, Sheffield and finally finishing at the o2 Arena in London. Hi, I’m trying to book the same for my daughter how did you find and meet and greet package ?